In celebration of surpassing 1,000,000 downloads on dafont.com, I thought I would share these screen-captures of past and current download statistics. Not that I have much to brag about (Only four fonts in the top 100 right now for example, most of which that have remained in the top100 since their debut/never leaving, yawn.....) but since these stats are not made public (thankfully) maybe they'd be interesting to some, if not other designers on dafont who would like to compare. And let's not beat around the bush here, I am revealing my download statistics, well, because I am a bit proud of them. Some of them at least. My only regret is I did not get a screen capture when LT Chickenhawk first appeared on the site. 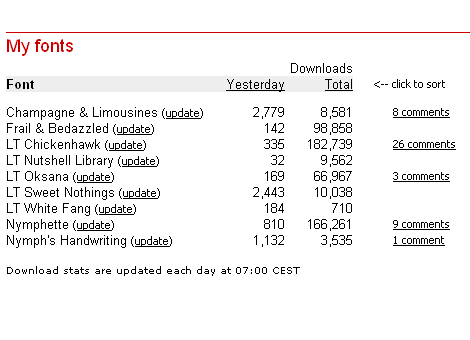 At it's peak daily downloads passed the 10,000 mark. Yes ten-thousand-downloads in one 24-hour period! During it's three week stay in the #1 spot on dafont.com's Top 100 (over three weeks if you want to get technical, but who's counting? ), it was regularly getting anywhere between 5,000-9,000 downloads daily according to my download statistics. Though I didn't get a screen-capture during LT Chickenhawk's Heyday, the stats on these screen-captures are nothing to scoff at. Well except for those of poor LT Nutshell Library maybe. Always a low turn-out for that one. They can't all be winner's right? But most of them are, as you will see with my dafont download statistics revealed. Add em' up. Over 1,000,000 downloads since the debut of my first font on dafont.com, December 11, 2008*. Thanks for the love dafont!. I don't care what anyone says about free fonts, you're still the best font site by far. W00t! 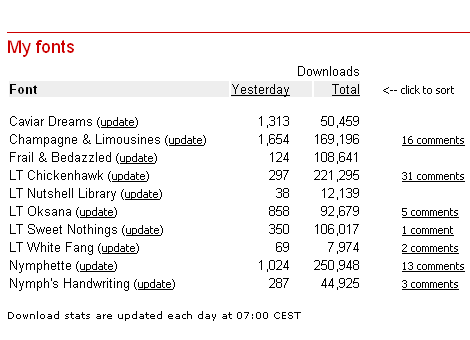 GB1911 is likely to hit 50000 downloads today (an odd coincidence, because I hardly ever check), while Prociono (which I think is much better) is still below 39000. Those are the only two I’ve posted at dafont so far. Because mine are free software and available at Open Font Library, they get used in Linux distributions and the like, but I don’t get statistics. Certainly dafont is the site for maximum download count; it's practically the only site a lot of people know. You're right, dafont stats are way higher than any other font-download site by far. DeviantART for example, some of my fonts get downloaded only a few times a day, and some days no one downloads them at all. This is one of the many reasons why I love dafont! I found your Caviar Dreams font on dafont, great site great font, I am currently using it to put a site up for a friends photos, I will let you know when it is online. Tweet, tweet! I love Twitter. Remember the good ol' days? I do. Sigh... Follow me! I'm Lauren, self-proclaimed "dweeb," and "the coolest person I know." Single mom, making fonts & designing stuff in my free time. What began as doodling Fraktur during class, as an adult became focused creation of typographic art for print and for screen, including this digital type experiment I call "Nymphont." I do freelance web and graphic design along with type design. The icons below link to social networks and bookmarking sites that I am involved with. From the fabulous Las Vegas, Lauren "Nymphont"